Updated on March 17, 2018 to reflect that the new T-Mobile tower is live. Wintergreen's mountain is getting two new cell phone towers in 2018. One of the new towers is bringing T-Mobile to the mountain for the first time. The other new tower is scheduled to be built by Verizon later in the year. It will replace Verizon's current wooden pole tower with a taller steel tower near the same location (on Water Works Lane, across from Founder Overlook on Wintergreen Drive). It's expected the taller tower will increase the area covered. • How far can a cell phone pick up a signal from a tower? 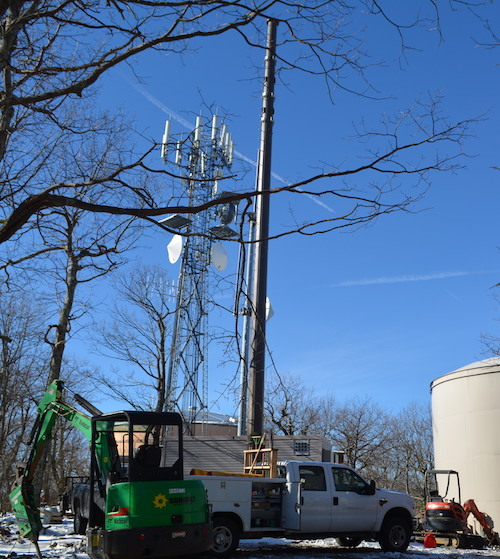 It's likely both Verizon's replacement tower and T-Mobile's new tower (on Fern Circle at the water tank just off Devil's Knob Loop) will offer state-of-the-art 4G-LTE service. In 2018 T-Mobile joined AT&T, Verizon and Sprint in offering cell service on Wintergreen mountain when this tower just off Devil's Knob Loop goes into service. When the new additions are completed, there will be seven cell phone towers on the mountain and two in Stoney Creek, says Curtis Sheets, who is the lead administrator regarding cell towers on Wintergreen property in addition to his job as chief of Wintergreen Fire and Rescue operations. Which cell phone service provider is the best choice for those at Wintergreen? There is no clear champion, says Sheets. AT&T has the most towers at Wintergreen, with one in the valley at the fire station in Stoney Creek and three on the mountain. Two of AT&T's towers are near the other cell towers on Fern Circle and Water Works Lane, plus AT&T has a lone tower at the top of the Big Acorn ski lift (near Pinnacle Drive). That gives AT&T an overall coverage edge. But, Verizon–which has only one tower at Wintergreen–has the best coverage in Nelson County, notes Sheets. Sprint (which came to Wintergreen when they merged with nTelos) offers good coverage in much of Stoney Creek (with a tower at the water tank off of Hearthstone Lane) and Sprint has two towers on the mountain. Wintergreen Mountain has been the site of a pilot project with Central Virginia Electric Co-op and Siemens to develop a new high-tech means of better controlling an electric grid using a network that relies on cell towers to communicate. See a (very technical) report by Siemens HERE. As a public safety professional Sheets would like to see more of Wintergreen covered with adequate cell phone service. Much of the northern half of the homes on the mountain now have no cell coverage and there are dead spots areas in Stoney Creek. While he couldn't go into specifics, he said the property owners association would likely "cut a deal" with a provider to broaden the coverage in some areas. While not on Wintergreen property, there is now a Sprint tower the intersection of Routes 664 and 151 (across from Devils Backbone) and in late 2017 Nelson County approved an application from Verizon for a tower in the same area. What cell service does the fire department use? The on-duty emergency manager has a small suitcase that carries two cell phones (Verizon and Sprint)–and a satellite phone.